A full color lamp of knowledge soars on 3 shooting stars on this fun Tri Star Resin. Personalized for your event this trophy is the perfect budget friendly recognition of academic excellence. If you're looking for something a little "outside the box" from the usual trophy that still reflects the traditional look, this award fits the bill. The black textured curved back of the trophy is framed in shining gold, and the front features a gold lamp of knowledge cutout that gives it a 3 dimensional look. This sleek, modern trophy is mounted on a black pedestal base that has plenty of room to personalize for your event and is available in 2 sizes. 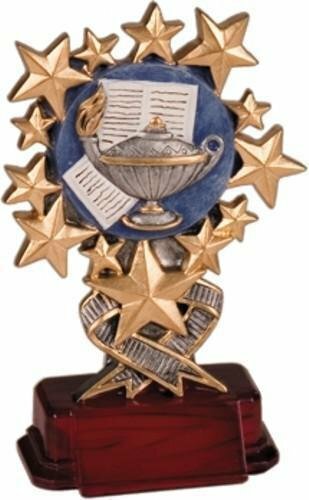 Your star academic performers will love this new take on a traditional trophy.